The seventh season of the Superkarts! 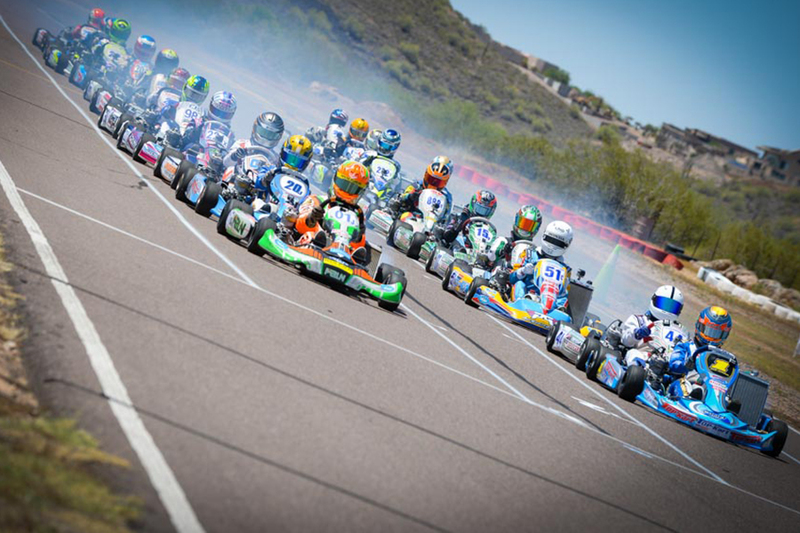 USA Pro Tour is set to get underway this weekend at the Phoenix Kart Racing Association in Glendale, Arizona. The 2016 season is projected to be another exciting and record breaking year. Full television coverage is returning thanks to the partnership with CBS Sports Network and MotorTrendOnDemand for another season, and another large prize package well worth over $150,000. A total of nine categories in eight race groups are set to compete over the Pro Tour journey, traveling to Phoenix before a return to Indiana for the SummerNationals with the celebration of the 20th SuperNationals set for November in Las Vegas. The PKRA ‘Formula K Raceway’ circuit is among the most challenging layouts in North America with Superkarts! USA history with the facility dating back to the first ever national event held in 1999. Its fast, tight, and for the first time in SKUSA Pro Tour history, the track will be contested in the counter-clockwise direction. The ‘full course’ measures out to 7/10 of a mile at 12 turns with the popular banked ‘Daytona’ corner. eKartingNews.com, the official media partner of Superkarts! USA, is proud to present the seventh straight year of Trackside Live coverage of the SKUSA Pro Tour. Those unable to attend can enjoy live audio and live timing at the EKN Live page – ekartingnews.com/live. Daily race reports can be seen each day, along with updates and results posted to the Official Discussion Thread, in addition to the EKN social media feeds – Facebook, Twitter, and Instagram. All TaG divisions are utilizing the IAME engines, with the Junior and Master categories making the full commitment to the X30 powerplant. Each division enters the weekend with high numbers and top-level talent to contend for the victories at PKRA. For the first time in SKUSA Pro Tour history, the X30 Junior category has sold out at the SpringNationals. Forty-one young guns are set to battle in Phoenix to become the inaugural X30 Junior winners, as 2016 marks the first season utilizing the popular powerplant. The title chase in Junior came down to just one point in 2015, with Brandon Lemke edging out 2014 champion David Malukas for the championship. Lemke has graduated on to Senior, Malukas is focused on his European campaign and the rest of the top-five are also graduated, leaving the top of the Junior ranks wide open. The full field of 41 drivers leaves plenty of options to assume the role of top Junior driver in SKUSA. Currently, the early contender list holds near the top Oliver Calvo, Junior class rookie. The PKS / Top Kart pilot came just one corner short of a possible win in the TaG Cadet feature at the SuperNationals last year. 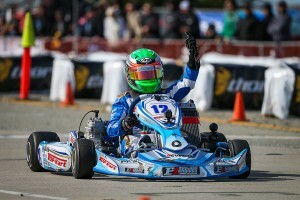 Now, he is coming off a victory at the third round of the California ProKart Challenge, moving him to the top of the championship chase at the half-way point. His PKS / Tony Kart teammate Tomas Mejia is right behind him, and lead the strong list of Junior class rookies heading into Phoenix. Jagger Jones is among the top returning drivers in the Junior ranks. The Ryan Perry Motorsport / Tony Kart driver has three-straight top-five finishes at the California PKC and just last weekend finished fifth at the CIK-FIA Academy Trophy competition in Essay, France. Dante Yu (J3 Competition / COMPKART) is another returning driver, showing great improvement over the winter with victory at the opening weekend of the California PKC. Yu also traveled across the Atlantic, competing in the X30 Challenge Europa and was among the quickest drivers at the event, only to have a few mechanical issues hurt his overall results. Trey Brown is set for his second year in the Junior category following a strong rookie campaign in 2015. Brown has made the switch over to Nash Motorsportz aboard a CRG chassis, already producing strong results in the last month. From the east are a number of top pilots, looking to keep the title on their side of the Mississippi for a third straight year. Alex Bertagnoli finished 2015 among the contenders, making his Superkarts! USA debut at the SuperNationals in November. The Franklin Motorsports / Merlin driver finished fifth, and followed it up with a victory at the WKA Daytona KartWeek. He’s gone winless in the last three races, but a fresh start at another new track could spark a run. Lance Fenderson finished the inaugural WKA Winter Cup with five wins in six races to claim the championship, and has two wins in four starts in the WKA Manufacturers Cup Series. Driving for the new Patrick Karting operation, led by Danica Patrick’s father TJ Patrick, the Tony Kart driver will be one to have on the watch throughout Friday. Leading the WKA championship chase is Pauley Massimino as the Top Kart USA, like Fenderson, is making his SKUSA debut in the Junior ranks. The numbers in the Master division have always been up and down. Last year, the numbers were much lower than the average of the Pro Tour, but the racing was just as intense with the championship going down to the wire. 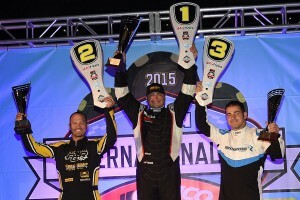 Nick Tucker and Chris Giumarra each had a double-win weekend from the SpringNationals and SummerNationals, but Tucker prevailed after a hard-fought week in Las Vegas to claim his first SKUSA Pro Tour championship. Tucker will attempt to become the second driver to claim multiple championships in the Master division, matching that of Ethan Wilson (2010,2014). If Tucker is able to defend his crown, moving over to the Rolison Performance Group operation aboard a Kosmic chassis, it will be a first back-to-back champion since Colton Herta did it in TaG Cadet (2010-2011). Giumarra is back to improve on his vice-champion position last year, returning with the Checkered Motorsports team and carrying the SKUSA #2 plate on his PCR. Vatche Tatikian will debut the SKUSA #3 plate on his Phil Giebler Racing / Ricciardo machine in Phoenix. It was his best season on the Pro Tour and on the regional side, earning the 2015 California ProKart Challenge championship. Nine of the top-10 in points from 2015 are entered for the SpringNationals, including Anthony Honeywell (Tanda Racing / Praga), former series champion Scott Falcone (Rolison Performance Group / Kosmic), Cristian Vomir (M Power Racing / FA Kart), Brian Phillipsen (Maxx Motorsports / Praga), Mario Barrios (BBR Racing / Gillard), and Laurentiu Mardan (Pole Position Racing / Tony Kart). All 24 competitors this year will be on the spec X30 from IAME for the first time in Pro Tour history. Looking to make history is former SuperNationals race winner John Crow. The new Musgrave Racing Company / Praga driver has been nearly unstoppable in Southern California, and is among the favorites entering the SpringNationals weekend. New names have been added to the ‘young guns’ side of the Master division with the debut of Franklin Motorsports owner Jamie Sieracki. A podium contender in Senior back in 2013, the Wisconsin pilot is jumping back behind the wheel of a Merlin machine for the first time since making 50 laps at the RoboPong event in October 2015. Derek Wang has competed in the S4 division for the past few seasons, making the switch over to the single-speed category with BBR Racing aboard a FA Kart.